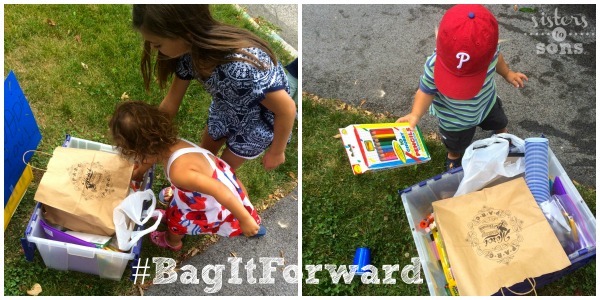 *Disclosure: This post was sponsored by The Motherhood as part of my participation in the #BagItForward Campaign. All opinions expressed are my own. Last week I crossed a few items off our summer bucket list: attend an outdoor concert, stay in pajamas and let the kids just play at home, and hold a lemonade stand. But it wasn’t your typical lemonade stand. 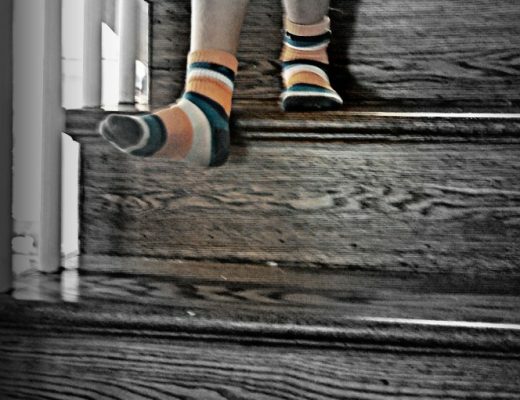 It was a simple service project that I could do with my kids. 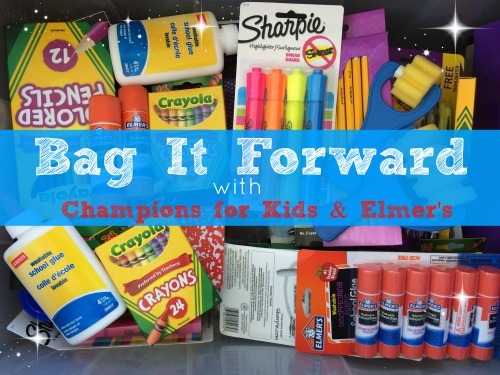 Champions for Kids, a non-profit that encourages families to do simple service projects for kids, has partnered with Elmer’s for a #BagItForward campaign. They are encouraging people to do SIMPLE service projects to collect school supplies for kids in need. A few weeks ago I attended a “Kindergarten Playdate” at the school my son will attend in the fall. He will have three different playgrounds to frolic on, access to laptops, iPads, and smartboards, a state of the art theater, a geothermal soccer field, a butterfly garden, an environmental bird garden, a library with over 17,000 books and more. Additionally, it is a “green” school with geothermal heating and cooling. This is all about to become his “normal”. However, I think it’s important for him to realize that it is not everyone’s normal. I talked to him about the fact that many other students don’t have all of these incredible resources and and many school lack basic supplies. We decided that it would be super SIMPLE to help these kids out so their teachers are not left with the burden of using their own money to buy basic supplies. This is where the idea of the the lemonade stand came to be. Instead of collecting coins and donations from generous passerby’s, we invited our neighbors to come to our house, donate school supplies, and enjoy some lemonade (more lemonade ended up on the ground thanks to my very independent son who wanted to be in charge of pouring…. but that is besides the point). Within the hour we collected a an entire crate full of supplies…. And when other neighbors got wind of the service project, even more donations were dropped off over the weekend. This was such a SIMPLE service project and my kids had tons of fun. We plan to donate our #BagItForward supplies to La Salle Academy in Philadelphia – a school that serves 3-8th graders who’s life opportunities are limited by financial, academic, social and/or emotional challenges. I’ve had the privileged of working with some of these students as a volunteer for the Dancing With the Students program – an amazing program that teaches ballroom dancing to students in low socio-economic areas. These students are some of the most grateful and gracious children I have ever come across and I know they will appreciate the school supplies we are donating. If you are interested in donating money or supplies to this school, you can do so via their website HERE. You can help by bonding with kids in your community to create special memories. 1. GATHER your family, friends, neighbors, or co-workers. Ask each person to bring new, quality school and crafting supplies to donate. You could assemble them into kits for classrooms or individual students, and even volunteer to help with a creative project in a classroom, day-care center, after-school program, or community organization! 2. LEARN about the needs of children in your community. Ask a teacher how you can share your time and resources to help kids thrive! 3. GIVE the supplies your group has collected to a teacher, school, or local children’s shelter. 4. SHARE your story with us at championsforkids.org/share so that we can celebrate your participation and inspire others with creative ways to bond with children and provide the supplies they need to thrive! How many people were involved, and how many items did you collect? Please let us know that you are ONE of Millions who helped us reach our goal of helping 20 million children by 2020! Take part in Champions for Kids’ SIMPLE Giving program this summer! Visit your participating Walmart store between July 7 – August 1 and look for the purple product display and yellow donation bin. Choose school supplies and donate them right inside the store to help children in your local schools! 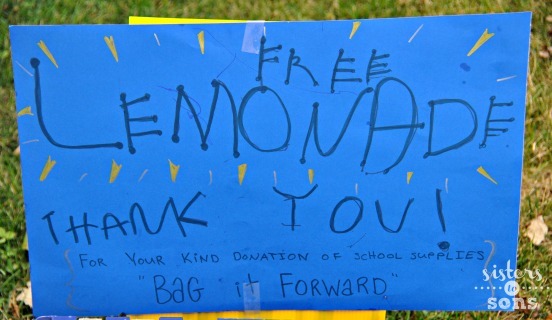 Love the Lemonaide Stand and the idea of giving back early in their lives. Teaching children and a neighborhood to work together…sounds like a great idea. What a great initiative – AND – I want to go to your son’s school – AMAZING!!! Wow, it sounds like a wonderful program! It’s awesome that you volunteer to help them with dancing too. I love the concept of this program what a great idea and way to give back to others in your community. Love that I can donate while shopping at Walmart! I think I will make this a great learning exercise for my kiddos on our next trip. Thanks for sharing! I love everything about this. The cause, the execution, all of it. 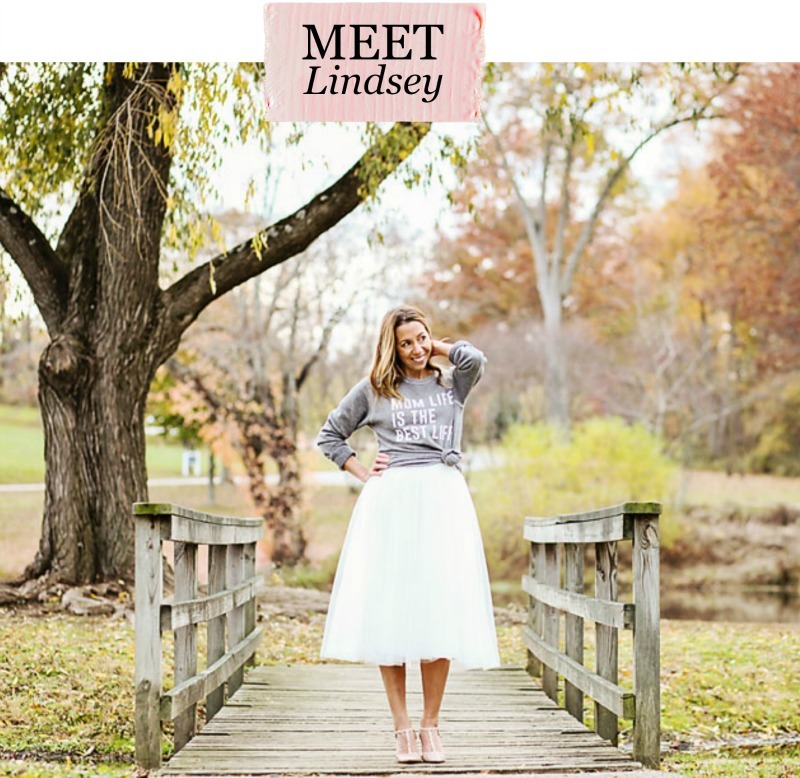 Love that you are sharing it all with your children!